Virtual reality platforms have made great strides since Palmer Luckey debuted the Oculus Rift in the summer of 2012. Improved tracking and 3D audio have also led to deeper levels of immersion and while far from flawless, the visuals are much more believable than they were in the early days. Despite all of the advancements, however, hardware makers and developers haven’t yet figured out the best way to interact with objects in the virtual world in a way that isn’t totally void of the real world. It’s an issue that many in the industry are working on including Disney Research. 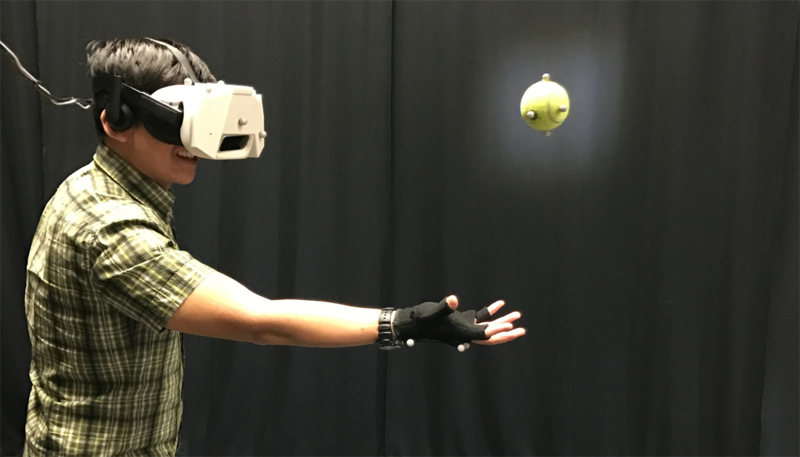 In a recent paper on the matter, Matthew Pan and Günter Niemeyer of Disney Research Los Angeles created a system that enabled them to accurately catch a real ball while fully immersed in a virtual reality environment. They used an OptiTrack Flex 13 motion capture system capable of tracking the motion of the ball and the catcher’s hands and head at 120 frames per second with a latency time of just 8.33ms. Also on hand was a respectable PC (Intel Xeon E5-2680, 32GB of RAM and a GeForce GTX 970 graphics card) running Windows 10 and an Oculus Rift for the experiment. To test the system’s effectiveness, they tossed the ball 140 times; it was caught 132 times. Catching a ball isn’t terribly exciting but the research could go a long way towards building practical systems for VR that help bring the real world into VR, something that’ll be key to boosting immersion.